Incoherent Thoughts: Ramadhan... a month of "excesses"? Ramadhan... a month of "excesses"? Welcome O' holy month of Ramadhan. A month of goodwill and blessing. Of peace and serenity and of freedom and abstinence. The last bit was a bit contradictory there but its true nonetheless. For a whole month all Muslims and believers are free from the evil clutches of the devil and any naughty doings or bad deeds are blameable to no other but yourself. But we ain't totally free. No no no no no... it is throughout this holy month of Ramadhan that we Muslims are given our biggest test. Abstinence of spending. Yeap thats right... every year during Ramadhan Malaysian Muslims are guilty of overspending. Temptation proves itself to be powerful thing indeed and it comes in many shapes and sizes. 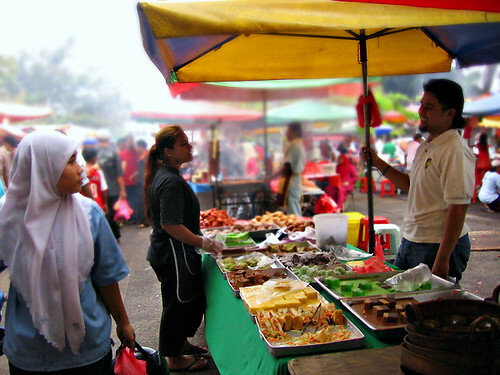 But througout Ramadhan its ultimate guise is the Ramadhan Bazaar. Although... in a way fasting folks actually dont stand a chance against the irresistable pull of the bazaar. I mean how can a hungry person withstand the allure of all that food. Especially those exotic cuisines that seems to be synonymous with Ramadhan and Hari Raya like the 'bubur lambuk' and 'rendang'. Suddenly there goes your will power and you NEED to buy that tasty titbit and that mouthwatering snack. Come Maghrib you wonder how your stomach is gonna fit all that food. tsk... tsk... tsk... thats temptation for you. Temptation does not limit itself to merely the consumers. Lets talk about the businessmen. Why is it all of a sudden the price of a measly fried chicken shoots up from rm2 per piece to rm3? The chicken piece doesn't seem to be any bigger... nor is the recipe any different. What's that you say? Oil prices went up? But didn't it go down again just a few weeks back? hmm... curiouser and curiouser. Moving along to the next stall the mystery deepens. The prices are the same, yet the meal looks like it has been cut in half. tsk... tsk... tsk... how much of a profit margin are we talking about here? Closer and closer to Syawal temptation's magic grow steadily stronger. Malls are bursting at the seams with people and somehow everyone and everything seems to be spanking new. New clothes, new curtains, new car, new furniture... the list goes on. When it rains... it pours!